Johann Gevers was an early pioneer of the Swiss blockchain scene with his payments firm Monetas. An entry in the Swiss commercial registerexternal link indicates that the courts in canton Zug have finally lost patience with Monetas, which has been dissolved. The company had been granted several stays of execution amid hopes that it could find a new owner. Monetas was created in Vancouver in 2012 by South African businessman Johann Gevers and was moved to Switzerland a year later where it was held up as a poster child of the nascent blockchain scene in Zug’s Crypto Valley – which he was instrumental in establishing. Utilising distributed ledger technology, Monetas planned to provide smartphone payment services to underbanked developing economies. A deal with the Tunisian post office in 2016 appeared to herald a major breakthrough for the firm, but the plan fizzled out. 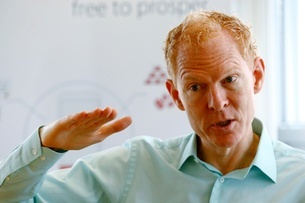 Gevers’s profile was raised when he became president of the Tezos Foundation in 2017, a body that housed $232 million (CHF232 million) from a then-record “initial coin offering” crowdinvesting scheme to develop the Tezos blockchain. But the project turned sour when Gevers fell out with Tezos creators Arthur and Kathleen Breitman. Gevers later stepped down from the Tezos Foundation. At around the same time, Monetas’s financial problems emerged and a Zug court started bankruptcy proceedings in December 2017. At the start of last year, United States finance company Artillery One stepped in with an offer to buy out Monetas, prompting the court to grant the firm a lifeline. That deal collapsed in acrimony last summer, but swissinfo.ch understands that it did not die out completely. Since then, the courts have extended the life of Monetas several times. In January, a final deadline of April 29 was set for the ailing company to finally resolve its issues. But before that deadline expired, the Zug court decided that enough was enough and initiated bankruptcy proceedings again. Neither Gevers or Artillery One were immediately available for comment. In a note to investors, seen by swissinfo.ch, Gevers said the liquidation process should take a year to complete. “It is unclear at this point what consequences the liquidation of the subsidiary will have for the parent company [incorporated in Anguilla]. All the investors are invested in the parent company, which owns the assets,” the note said.